Review of Anderson Valley Barney Flats Oatmeal Stout | Beer Apprentice - Craft Beer News, Reviews, Interviews and Info. Hello everyone. For today’s craft beer review I’m going to be drinking the Barney Flats Oatmeal Stout produced by the Anderson Valley Brewing Company located in Boonville, California. It’s been forever since I last reviewed an Anderson Valley brew. I’ve always thought that they produced solid beverages, so I’m pretty excited about trying this one. From the website, avbc.com, we find this little description to get us in the mood. This brew came in a 12 oz. bottle and it had an ABV of 5.8%. It poured a very deep brown color with some ruby hues outlining the bottom and edges of the glass. The cap was tan, smooth and creamy. It was decently sized, yet the retention time was only “so-so”. I thought that since it was a relatively low ABV Stout that it might hang around for a while. Oh well, the lacing seemed alright though. The bouquet smelled of sweet oatmeal and creamy milk. Some decent shots of chocolate as well as some light notes of coffee bean and toasted grains. The aroma was pretty nice. It wasn’t anything overly robust or complicated, however it was balanced well and it presented the proper attributes. The flavor gave the impression of being more forward with the bitter coffee characteristics. Maybe even a touch of tobacco also. It definitely released some roasted malts, toasted grains and toasted bread crusts. The chocolate and the oatmeal savors were a little bit muted, yet they were still accounted for. The mouthfeel was a sturdy medium. Smooth, chewy, mostly dry and just a touch chalky. Medium/low carbonation along with a firm amount of flavor was left behind to enjoy between sips. Well, we have a pretty good beer here. I don’t think it’s quite “world class” or anything, but it’s still mostly proper. It wasn’t as sweet as I typically like my Oatmeal Stouts, but I wouldn’t have a problem picking this up again or imbibing if it were offered. The drinkability was good and with the lower ABV I believe I could set a few of these down during a session without any trouble. Easily a beer to try during the Fall season. 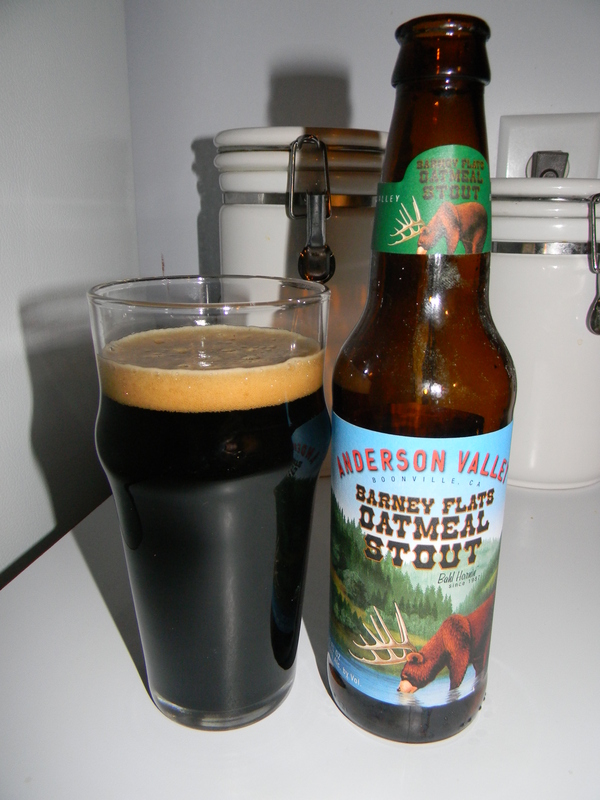 So, if you see the Anderson Valley Barney Flats Oatmeal Stout, and you have yet to try it, pick it up and give it a go. You may be surprised as to how nice it is.